Andrew Whitaker was a part of the Buffalo Soldiers. Whitaker trained at Fort Riley, Kan. alongside future baseball legend, Jackie Robinson. TUCSON, Ariz. -- They were an anachronism -- soldiers on horseback in a war fought with tanks and B-17s. Nevertheless, here they were during World War II, patrolling the rugged hills and canyons along the border between California and Mexico. "They were about four-hour shifts. I would relieve you and your horse. We would ride back and forth looking for men. We never found any," says Andrew Whitaker. 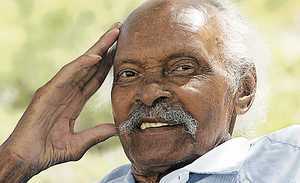 Whitaker, 87, was a member of the famed Buffalo Soldiers, all-black units formed by Congress after the Civil War. Nicknamed by the Indians they often battled against, the Buffalo Soldiers of the U.S. Army became a fixture on the Western frontier, tasked with everything from escorting settlers and railroad crews to fighting Indians. Many of those Buffalo Soldiers were stationed at Fort Huachuca, which served as home for several all-black cavalry and infantry units from the late 1800s until the Army was desegregated in 1947. Not so for Whitaker, however, who was drafted out of Chicago during the early months of the war. His outfit, the 10th Cavalry, trained at Fort Riley, Kan., headquarters for the Army's cavalry. Also training there was future baseball great Jackie Robinson. "He slept in our barracks and went away to officer candidate school," says Whitaker. It was at Fort Riley where the Chicago city slicker encountered his first horse, up close and personal. "You'd get up on the horse, fall off," says Whitaker, who soon mastered the necessary horsemanship skills. Harder to overcome were the prejudices and hatred of some whites in 1942 America. While rolling westward toward San Diego and their first assignment, Whitaker and others were subjected to rock throwing and name calling by white soldiers during a stopover in Phoenix. Apparently the whites did not realize blacks were traveling on the same train - but in separate cars - until they got off at the train station. "We did not expect that," says Whitaker. "They were off on the siding. The train picked up speed and we got away." Final destination: Camp Lockett, built in 1941 near the small town of Campo, Calif., about 60 miles southeast of San Diego. For two years, cavalry troops patrolled the border and guarded water supplies and railroads. "People would ask, 'How can you still ride horses?' It was what was ordered," says Whitaker. Practicality was also at play, since much of the border was too rugged for vehicles to patrol. Various horses were assigned to Whitaker during his two-year stay at the camp, including one he called simply "Whit." In 1944, the 10th Cavalry Regiment was inactivated and its men transferred to other units. With the cavalry's horses turned over to caretakers, the era of the horse soldier in the U.S. Army had finally ended. Some of the men were deployed to North Africa. Whitaker, however, received a medical discharge for a shoulder injured while handling the horses. He went back to Chicago, where in 1947 he saw Jackie Robinson make his Wrigley Field debut as a member of the Dodgers. In 1985 Whitaker moved to Tucson. Nine years later he would be in attendance as Fort Huachuca officials unveiled a newly released stamp honoring the Buffalo Soldiers. Though proud of the Buffalo Soldiers and his time spent as one, Whitaker has no qualms about desegregation ending that proud institution. "I think it was a good thing," he says softly.